Eleanor Roosevelt in Gila River, Arizona, at a Japanese American internment center on April 23, 1943. President Obama’s recent visit to a US mosque and his condemnation of the “inexcusable political rhetoric” perpetrated against Muslims by a number of the leading Republican candidates for president is an important step in trying to counter the growing anti-Muslim backlash that has come in the wake of the Paris and San Bernardino attacks. But the president and other leading civic and political leaders need to do much more if they hope thwart the climate of hate and fear that has been stimulated by the unconscionable anti-Muslim statements made by Donald Trump and other leading candidates for the White House. One person the president and others might draw strength from in this effort is Eleanor Roosevelt. On December 16, 1941, less than ten days after Japan’s devastating attack on Pearl Harbor, at a time when the Japanese army was furiously advancing on Malaya and the Philippines, and when Hitler’s armies had overrun all Europe and stood a mere 25 miles from the center of Moscow, Eleanor Roosevelt had the courage to challenge the American people not to give in to their fears. She had just returned from a trip to the West Coast, where she bore witness to the apprehension and rising hatred many of her fellow citizens had directed towards Americans of Japanese descent. Given that we had suddenly found ourselves thrust into a global war, some of the anxiety that the American people were feeling at this moment was understandable. But she was confident—as she wrote in her My Day column—in the ability of the FBI and Secret Service to ferret out any German, Italian, or Japanese agents who might represent a threat to the United States. And she calmly advised her fellow Americans to report any suspicious activity to the proper authorities. Perhaps, on us today lies the obligation to prove that such a vision may be a practical possibility. If we cannot meet the challenge of fairness to our citizens of every nationality, of really believing in the Bill of Rights and making it a reality for all loyal American citizens, regardless of race, creed or color; if we cannot keep in check anti-Semitism, anti-racial feelings as well as anti-religious feelings, then we shall have removed from the world, the one real hope for the future on which all humanity must now rely. Eleanor Roosevelt was correct when she observed that America’s response to the terrible events of December 7, 1941, represented one of the greatest tests the American people ever faced. Unfortunately, we did not live up to that test. The fear that the war inspired, coupled with the powerful forces of racism and racial profiling, led the War Department and many members of Congress to press Franklin Roosevelt to sign an executive order that allowed the War Department “to relocate” more than 110,000 Americans of Japanese decent living on the West Coast. Today, virtually all historians and legal scholars agree that FDR’s decision to allow the internment of Japanese Americans during the Second World War was a grievous error—a clear violation of their human rights and an unfortunate response to a kind of war hysteria that gripped the country, especially among citizens of the West Coast in the wake of the Pearl Harbor attack. And we should remember—as calls are made today to “register Muslims” or ban Muslim immigration—that FDR’s justice department opposed the idea on constitutional grounds and that the FBI reported no evidence of “fifth column” activities among the Japanese-American community at the time. But the hysteria of the moment, and the irresponsible behavior of such noted journalists as Walter Lippmann, who took up the evacuation cry on the grounds that “widespread sabotage was imminent”—a move which a furious Attorney General Francis Biddle likened to shouting “Fire!” in a crowded theater—led the president to give in to the very fear he had so eloquently cautioned us not to embrace as he first took the oath of office ten years before. 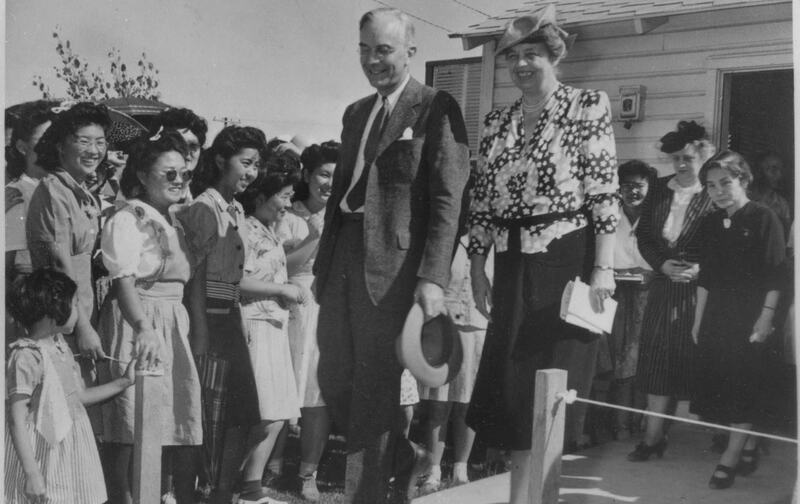 Eleanor Roosevelt was unequivocal in her opposition to the plan to intern Japanese Americans. But once FDR had signed the order, she found herself caught between her responsibility as first lady not to speak out against her husband’s policies in public, and her private conviction that the decision was wrong. As it became clear, however—much as she and others had always believed—that the Japanese community in the United States posed no threat whatsoever to national security and that any charges of disloyalty were absolutely baseless, she began to take action. In April 1943, she made a highly publicized visit to the Gila River Detention Center in Arizona, making sure that she was photographed in the presence of the internees—a powerful gesture given the endemic racism of the time. She also urged FDR to meet with the director of the War Relocation Authority, who by this point was also pushing for the release of the detainees, and in an interview with the Los Angeles Times at the end of that month publicly stated her view that the sooner the camps were closed, the better. The sad truth, however, is that in spite of these and other efforts, and the gradual release of an increasing number of the internees, it would not be until mid December 1944 that the exclusion order would finally be lifted. There is a lesson in this history for all of us, about what it means to be American; about the nature and meaning of freedom, and the unique role that United States can play in the world if we have the courage to reject fear and live up to the values that have inspired millions of people the world over to embrace the vision that is America in the hope of a better life for themselves and their children. It is this vision, after all, that led millions of Americans to fight and die for the cause of freedom in the Second World War, a vision so powerful that it inspired thousand of Japanese Americans to enlist in the American Army—even as their families were interned—to form the largely forgotten 442 Regiment, widely regarded as the most decorated combat unit for size and length of service in the history of American warfare.